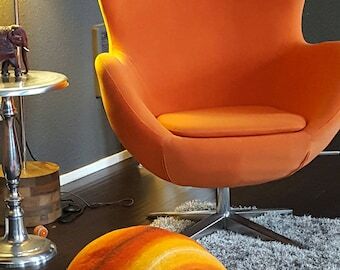 Loved the look and quality of the cat cave. I had to buy a 2nd one so that my cats wouldn't fight over it. I love it and my very conservative cat is getting used to it but slowly. We need to find the right location for her. It is so much better than the cardboard box that she was using. Colors are great. Since the early childhood I was very fond of art and handicraft. This led to my decision to study architecture, which allowed me to work in the field of furniture design for many years. Though, handicraft remained my hobby, and four years ago I got into felting, which became my full-time activity. I was so compelled by felting that I started to experiment. I have felted slippers for myself, my husband and son, whose feet was 44 EUR size, so they have turned out quite big. At the time our kitten was still pretty small and one day I saw him sleeping in my son’s slipper. 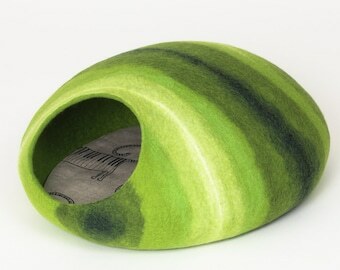 This made me consider to make a bigger “slipper” for him, which became a cat cave. 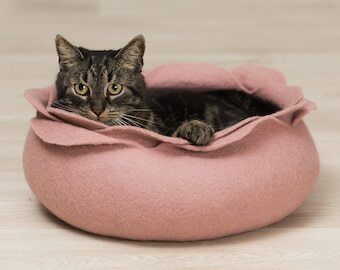 My kitty was keen on laying on pillows, therefore, I have sewed a soft mat to put inside of the cave. When the summer came, the kitten started to sleep on the cave. 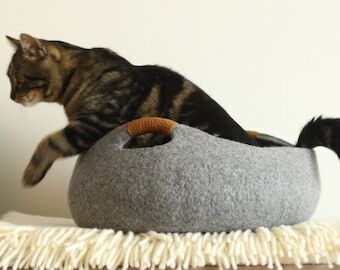 This gave me the idea to make an open cat bed. It has become an original proprietary houseleek bed. I personally have always loved the nature, which is my greatest inspiration and plays a big role in my life. This affection has made a huge influence on my works, for instance, my first cat cave looked similar to a stone. The entire collection includes interpretations of a flower, a leaf and a hornet’s nest. I experiment with different fibersand materials to create new textures and maintain caves’ shape unchanged. It is also worth mentioning that all caves are handmade using only wool, natural olive soap and water. I have great a family which is all very supportive. My husband has studied architecture and also adores cats. That's why he is so interested and helpful with my work. We live surrounded by the nature in our house on the fringe of Vilnius, where I also have my studio. 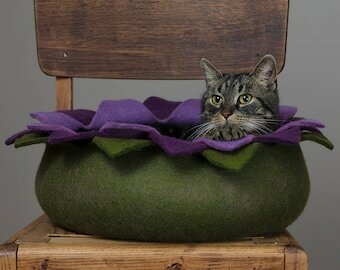 Again, our beloved kitty Rainis is always there to try new items, play with wool or watch me felting. He has a life of a prince surrounded by various cat beds and toys. We are very grateful that you choose our products and it is always a pleasure to get a feedback from our happy customers and their kitties. Welcome to elevele felt shop! I am happy to offer you high quality felted items. If for any reason you're not satisfied with your purchase, please contact us within 3 days of receiving. If I am unable to resolve the problem I will make a full refund of your purchase price, excluding postage. Returned item must be in its original condition. You will need to pay for shipping. My customers are very important to me and I will promise to resolve any problem. If you have any questions about payment - feel free to contact me. Lithuanian post, DPD, DHL EXPRESS SHIPPING. Please keep in mind that the orders are shipping from Europe and delivering with regular post service in the USA, Canada, Australia can take 2-3 weeks. For orders, which will be shipped through DPD or with DHL Express, delivery takes 2-5 work days. Door-to-door quick and cheap worldwide delivery is our excellence. Please add your phone number to your order, it is necessary for the courier to find you. I can reserve the item for 5 days. If during this period I did not receive payment, I will cancel your order. I package my felt items with care to be sure that it arrives to you undamaged. 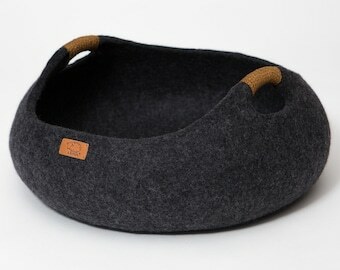 I will ship felt items anywhere in the world. Please note: all items are made by hand, so everyone is unique and no two items are identical.